Chicago—ALA Publishing eLearning Solutions announces a new iteration of our popular eCourse, Basic American Sign Language for Library Staff. Kathy MacMillan will serve as the instructor for a 6-week facilitated eCourse starting on Monday, May 20, 2019. American Sign Language (ASL) is an invaluable skill for library professionals. A basic grasp of ASL enhances your ability to serve deaf library users and opens up a new world of possibilities for baby storytime programs. It’s also a marketable professional skill that can translate to public service jobs beyond the library world. 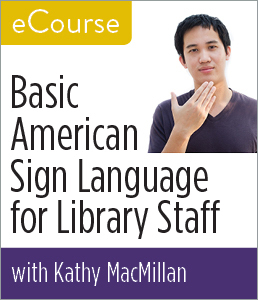 Ideal for those without previous experience, in this eCourse, librarian and ASL interpreter Kathy MacMillan will use readings, multimedia resources, and online discussion boards to introduce basic ASL vocabulary and grammar appropriate for use in a library setting. MacMillan will place ASL within a linguistic and cultural context, aiding participants in improving library services. Registration for this ALA Publishing eLearning Solutions facilitated eCourse, which begins on May 20, can be purchased at the ALA Store. Participants in this course will need regular access to a computer with an internet connection for online message board participation, viewing online video, listening to streaming audio (MP3 files), and downloading and viewing PDF and PowerPoint files.